The purpose of this site is to network with other carp fishermen, learn more about carp and to find more local and non-local carp water to fish. As you can see from my carp photos, I do most of my carp fishing alone so it would be great to find more folks to fish with. I also enjoy teaching people how to catch carp but you have to be a decent angler to begin with. Carp fishing has made me a MUCH better and more patient angler over the years. Living in Colorado, we only have about an 8 month carp fishing season so I want to find other warm water states to fish. I have seen unknown species of carp with my own eyes that were 5 to 6 feet in length and at least 80 or 100 lbs. and that was here in Colorado! Unfortunately it was private water so I was not allowed to try and catch one. I know there are large species of carp around the world so please contact me if you know of any! Carp are considered by most North Americans as a much maligned, non-native species of “trash fish”. They were introduced to North America in the late 1800’s and have proliferated to the point that I believe they inhabit every state in the US as well as much of Canada and I would assume, mexico as well. My first experience with carp was like so many others; I used to shoot them with a bow for sport as a kid. Even through that experience, I had to admire how tough carp are! I recall many swimming away with an arrow running through the fish. 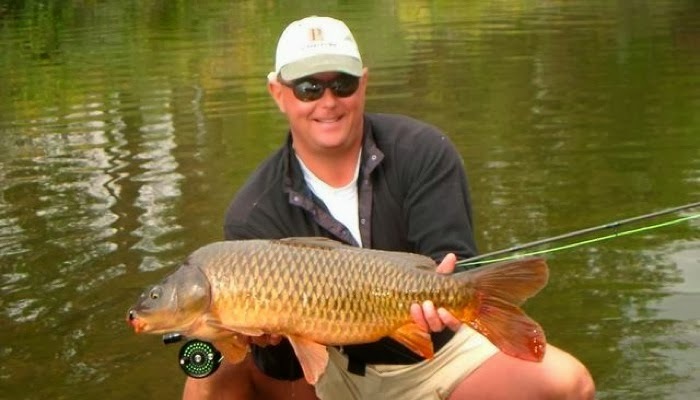 I have found carp to be a tremendous game fish, especially because I catch all my carp on a fly rod. Even if you think carp are trash fish, you have to admire how tough and adaptable they are. Most of the carp I catch are Common Carp (Cyprinus carpio carpio) and their mutated brethren, the Mirror Carp and Leather Carp. I also catch the occasional Grass Carp (Ctenopharyngodon idella). Grass carp are fun and they can be quite large but do not fight as well as Common carp and are MUCH harder to catch. The one good thing about the Grass carp is that they mostly eat dry flies which is always a good time! Carp are extremely tough fish. They are ancient fish and have been around for millions of years. They can survive huge variations in water temperature, salinity and pollution. I think that after a nuclear war, the carp will be around as well as the cockroaches! They can survive partial freezing and can slow down their metabolism to a hibernating dormant state in cold environments during the winter. I have seen huge fish that were well over 60 pounds in Hawaii in salt water alongside mullet and milkfish! It makes me wonder how big they can get when they can feed year round. The largest carp I’ve caught to date were around 40 lbs and were in a reservoir in my neck of the woods and that is covered in ice 2 to 3 months of the year. I saw fish that were substantially larger then 40lbs and look forward to going back there and fishing it again as well as the many other big reservoirs that I’m still waiting to explore. I’m waiting for my buddy Frank to get his new skiff so we can fish them properly. You really need a boat to cover the water in some of these really big reservoirs. I love carp because they are opportunistic omnivorous feeders. They eat all types of vegetation as well as bugs, crayfish, leeches, worms etc. Carp are hard to pattern and make trout look predictable and stupid. Every piece of water has its own subtle nuances so I have to learn different tricks for every pond, lake, reservoir, and river that I fish for carp. Another thing that really differentiates carp from other species is their unpredictable nature. Unlike other species of fish like trout, carp may be “easy” to catch one day and virtually impossible to get them to eat the very next day with exactly the same conditions which can be extremely frustrating. I have to tie flies that represent things that fall from trees like cottonwood seeds for instance. As I said, carp fishing has made me a much better angler. I have to be very observant and patient to be able to consistently catch these fish. That’s what makes carp fishing so addictive in my opinion. Another thing I like about carp fishing is that over 99% of the carp I catch I site fish to. So, I’m fishing to specific, individual fish every time in clear water. Some water is crystal clear and some is more turbid but I have to be able to see the fish or if it’s tailing, at least see the tail and the direction the fish is facing. My window to get the fly in is literally less then 3 inches in diameter. I have to get the fly right in front of the fish and moving away from, not towards the fish. Just as in salt water fishing, the fly has to be fleeing the pray otherwise it’s completely unnatural and the fish will spook. There is nothing more satisfying in fresh water then feeding a fly to a tailing fish in a clear river or lake and watching the fish eat the fly and then setting the hook! ATTENTION ALL EUROPEAN CARP FISHERMEN (AND WOMEN)! Unlike most Americans, you guys have the carp love! I know you are willing to spend a lot of Euros to fish dirty carp ponds with bait rods and special alarms and such. We have an almost unlimited supply of carp water in the U.S. both private and public. You guys would freak out at the fishing we have over here and there’s lifetimes worth of quality water that is FREE. I think you would enjoy fishing clear water where you can actually see the fish. And any fly fisherman would be blown away by the quality and quantity of carp water we have here in the U.S. Carp fishing is definitely some of the most aesthetically pleasing freshwater fishing I’ve ever done. I have friends that have saltwater flats skiffs that guide on some of our big reservoirs. Some of my favorite fishing is right in the heart of big cities. Good fun! Leave me a comment if you want more info.